An undergraduate student of Nnamdi Azikiwe University, Awka has been found dead in Anambra state. 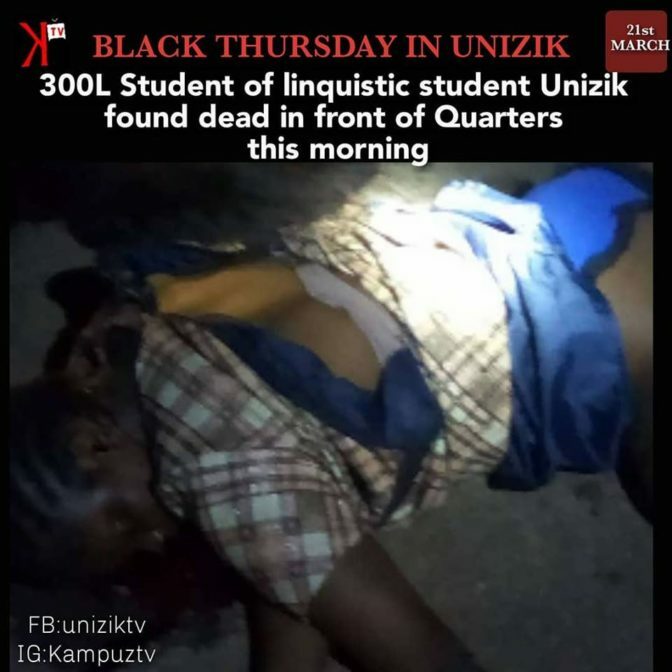 Many people have expressed shock after a 300 level student of Linguistic Department in Nnamdi Azikiwe University Awka (UNIZIK), was found dead in front of commissioners quarters in the capital city of Anambra state. This was revealed by the Students Union Government (SUG) vice president of the institution, Cynthia Uwah, who disclosed the female student identified as Pauline was found dead and has been taken to the mortuary by the chief security officer of the school. The SUG VP has urged the students to exempt themselves from night movements and stay vigilant for their own safety.